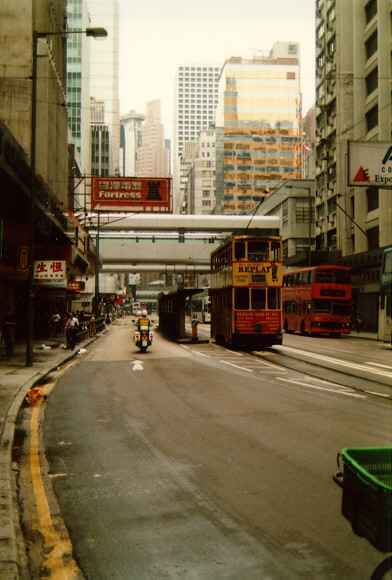 The Streetcars in Hong Kong are one of the best things with Hong Kong. For a flat fee of HK$1.20, exact change required, you can travel on the trams to anywhere between Kennedy Town and Shaukiwan. This has to be one of the greatest travel bargains ever. Despite the slow speed, if you manage to get a seat right in front and upstairs, these double-decker streetcars offer a first-class view of Hong Kong. The tram line was built in 1904 on what was then the shoreline of Hong Kong Island, all land from there to the sea is reclaimed land (quite a lot). The streetcars running today was built in 1950s and 1960s. The walkway in the backgound is a part of the Hillside Escalator Link, Hong Kong's latest transport scheme. Basically, the system consists of escalators and moving walkways, called 'travelators', elevated above the street level. The present escalator-travelator is 800 metres long, the world's longest.